Beijing News (Reporter Zhao Yibo) Foxconn is one step closer to the A-share market. On the evening of May 11, the China Securities Regulatory Commission’s official WeChat news release stated that it had approved the initial application of Foxconn Industrial Internet Co., Ltd. (hereinafter referred to as FII, Foxconn) in accordance with legal procedures. Foxconn and its underwriters will negotiate with the Shanghai Stock Exchange to determine the issuance schedule and publish the prospectus documents. After 36 days passed, the initial fundraising scale became a mystery. Previously, Foxconn’s IPO market was extremely fast. According to the official website of the China Securities Regulatory Commission, on February 1, Foxconn submitted the original manuscript submission, which was accepted by the SFC on that day. On February 9, the Securities Regulatory Commission disclosed the prospectus of Foxconn’s initial public offering of shares, indicating that the world’s largest OEM company is about to hit A shares. On February 23, the Beijing News reporter saw the official website of the China Securities Regulatory Commission that the Foxconn prospectus had entered the “pre-disclosure update” status on February 22. On March 8, the official website of the China Securities Regulatory Commission disclosed that the Foxconn IPO had successfully met. Facts have proved that from the first submission to the meeting, Foxconn spent only 36 days, setting a record for history. According to the IPO procedure, Foxconn passed the roadshow inquiry and offline placement after the meeting was approved and issued, and it could be listed and traded in the event of no accident. On May 11, Foxconn finally waited for approval. However, it is worth noting that in the official WeChat of the China Securities Regulatory Commission on Friday, Foxconn’s initial fundraising scale was not disclosed. On the afternoon of May 13, the Beijing News reporter consulted the Securities and Futures Commission’s securities and futures supervision and management information disclosure catalog, and Foxconn’s relevant approval has not yet appeared. The latest one is April 23. According to the prospectus released by Foxconn earlier, the IPO will apply for raising funds of RMB 27.253 billion. The funds will be used for the construction of industrial Internet platforms, including cloud computing, 5G, Internet of Things, and intelligent manufacturing. Through this IPO, Foxconn will improve its financial statements. As of the end of last year, the total liabilities were 120.4 billion, and the debt ratio was 81%. From the prospectus, Foxconn’s liabilities are relatively large. As of the end of 2017, Foxconn’s total assets were 148.6 billion yuan, total liabilities were RMB 120.4 billion, and the debt ratio was approximately 81%, which was almost double that of the 43% as of the end of 2016. 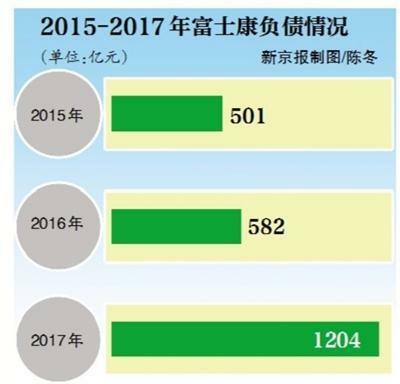 Its total debt as of the end of 2016 was 58.2 billion yuan, which means that compared to 2016, Foxconn’s liabilities increased by 62.2 billion yuan, an increase of 106.8%, which doubled. The prospectus shows that, as of the end of last year, total liabilities were 120.414 billion yuan, total current liabilities were 120.238 billion yuan, and non-current liabilities totaled 0.32 billion yuan. The liabilities of the company consist mainly of accounts payable, other payables, short-term borrowings, employee compensation payable, etc. At the end of 2017, the company's asset-liability ratio was 81.03%, an increase of 38.14 percentage points from the end of 2016. This was mainly due to the fact that the balance of payable restructuring costs brought by the company's restructured assets acquired through cash payment was included in other payables at the end of 2017, resulting in the company The current liabilities have increased significantly. The Beijing News reporter noted that as of the end of 2017, the book value of accounts payable by Foxconn increased by 33.796 billion yuan from the end of 2016. According to Foxconn, the main reason is that the growth of downstream orders since 2017 is good, and the company has increased the purchase amount of raw materials and equipment accordingly. Compared with the industry, Foxconn's debt ratio is also at a high level. According to the listed companies of the same industry disclosed in the prospectus, Foxconn's asset-liability ratios in 2015-2016 were 45.72% and 42.89%, respectively, which were lower than the comparable company's average of 57.17% and 56.88%. In 2017, Foxconn’s debt ratio was 81.03%, which was higher than the 57.73% of the comparable company. Foxconn said that after the raised funds are in place, the company’s total assets and net assets will increase significantly, the current ratio and quick ratio will increase significantly, and the level of assets and liabilities will further decline. The optimization of the company’s capital structure, as well as the enhancement of its financing capabilities and anti-risk capabilities, will provide a favorable guarantee for the company’s market expansion and strategic deployment. The Beijing News reporter noted that Foxconn’s interest expense is not high despite its large scale of liabilities. The prospectus shows that Foxconn’s interest expenses in 2015 were 990 million yuan, 620 million yuan in 2016, and 1.06 billion yuan in 2017. If the total debt is RMB 120.4 billion and the financing cost is 5%, Foxconn's financing costs will reach RMB 6 billion, and the actual RMB 1 billion interest expenses will be significantly lower than the estimated financing costs. Although interest expenses are not high, Foxconn’s exchange losses are large. Due to the overall upward trend of the exchange rate of the US dollar against the RMB during the reporting period, the exchange losses of the company in 2015, 2016, and 2017 were respectively 0.22 billion yuan, 236 million yuan, and 901 million yuan. What is slightly optimistic is that the prospectus shows that Foxconn’s profitability is good. Foxconn achieved revenues of 272.8 billion yuan, 272.7 billion yuan and 354.5 billion yuan in 2015-2017. In 2016, operating income slightly decreased by 0.03% from 2015, and operating revenue in 2017 increased by 30.01% from 2016. Foxconn's net profit for 2015-2017 was 14.35 billion yuan, 14.37 billion yuan and 15.87 billion yuan, of which net profit in 2016 increased by 0.11% from 2015, and net profit in 2017 increased by 10.45% compared to 2016.